Here at the Baking a Moment household, Spring is all about birthdays. Both my boys were Spring babies, and I love that! When they were first born, I loved that just when we were ready to venture out of our little cocoon, gorgeous warm breezes were beckoning us to go on long stroller walks. And now that they’re bigger, I love that presents, parties, and games are there for them, just when their house-bound stir-craziness is at a fever pitch. Since baking’s my favorite (;)), I always try to come up with something super-special and fun for them on their birthdays. 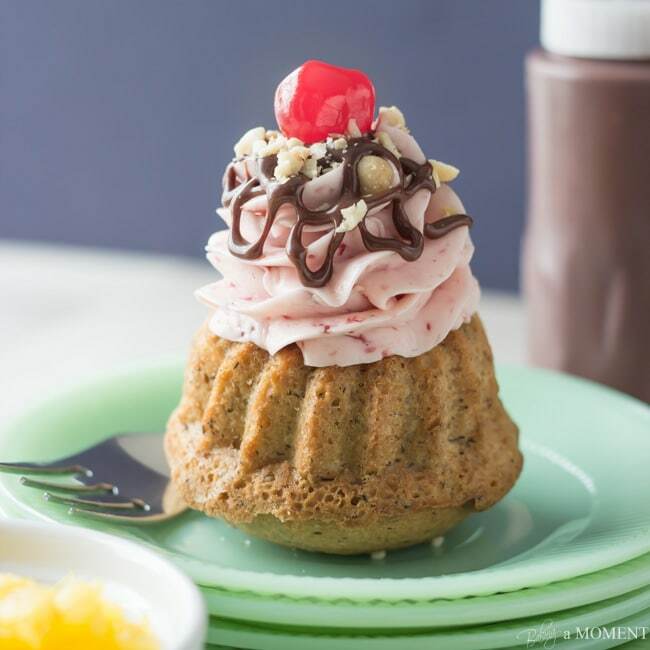 These little banana baby cakes are baked up in a mini bundt pan. This kind of pan gives you cakes with a little well in the middle, and it’s the perfect place to tuck something delicious. I got this idea from one of my bloggy idols, Alice, of Hip Foodie Mom. When I saw her do this, I knew my life would never be the same again, and I haven’t been able to stop thinking about it since. So, once the cakes are cooled completely, fill the little well in the middle with pineapple. If you’re serving them right away, coarsely chopped fresh pineapple is perfect. You could also use crushed pineapple from a can, just drain off the excess juice. Or, if you’re making them ahead, you could use the pineapple dessert topping that comes in a jar. They get topped with the most gorgeous strawberry Swiss meringue buttercream. It’s so silky and light, but buttery at the same time. And it’s so stable, it holds its shape beautifully and is perfect for piping. This recipe is loaded with fresh strawberry puree. Spring! I hope you’ll think of this fabulous recipe the next time you’re planning a party. 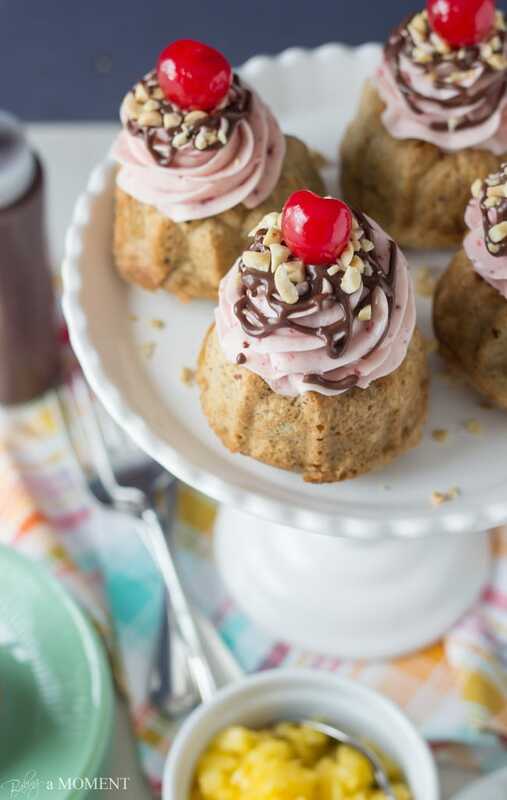 These banana split mini bundt cakes are sure to be a huge hit! Allie. . oh my gawd. . you are so sweet and. . Hello. . YOU are awesome! 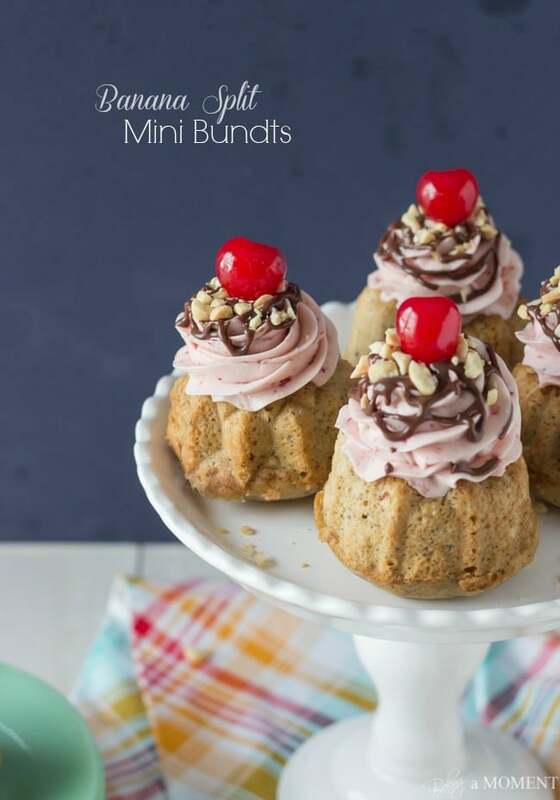 I love that you made BANANA SPLIT mini bundt cakes!! They look so good!!! your boys are going to love these!!! I just got Surprise Inside Cakes so I am going to *attempt* baking a cake for Phoebe’s 7th birthday (next month) for our “family” birthday party. . not attempting this for her real birthday party in case it’s a flop. Can’t wait to see you next month!!! I can’t wait!!! Miami, here we come. . Such a cute idea, Allie! These are awesome. Seriously, banana split in cake form looks incredible! Oh My God, I’m going to look of my mini bundt pan as soon as I close this tab! That is the most brilliant idea ever EVER. I need to try these as soon as possible I tell you. And they look so adorable oh wow how cute! I know, right? Alice is so smart. Love her ideas! Oh hello gorgeous, these cakes look just about perfect! 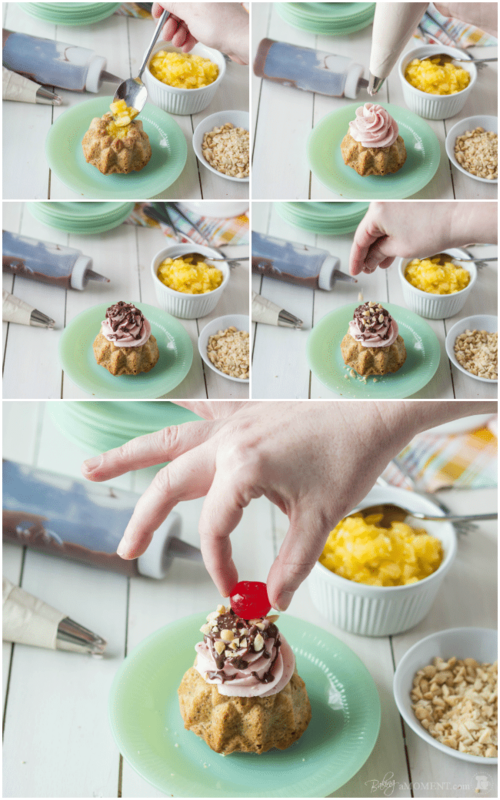 What a great idea for decorating mini bundt cakes! I bet your boys just loved these. That strawberry SMB looks heavenly! Thanks Natasha! They were a big hit, especially the strawberry buttercream! Well aren’t these just the cutest lil’ cakes ever? I actually own a mini Bundt pan, of all the things, so I’ll have to give these a try soon! Thanks Stephanie! And so nice of you to stop by. I hope you enjoy! I love the touch of whimsy the cherry on top adds. I have a thing for mini desserts! Oh me too! Totally. Everything’s so much cuter when it’s individually portioned. Thanks so much for the sweet comment! First off, that cake plate is to die for! LOVE! 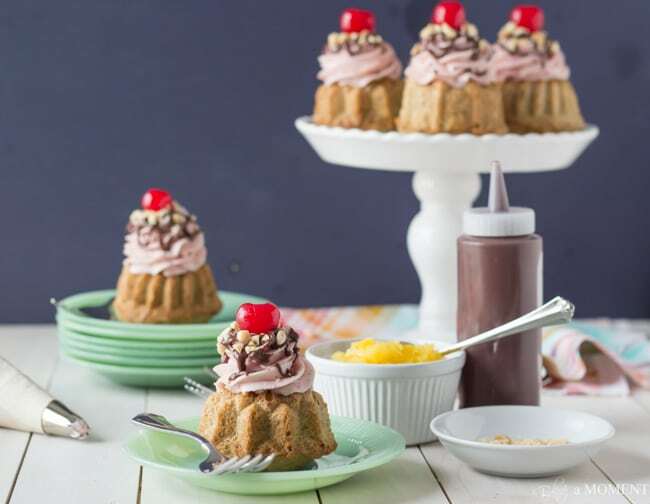 Second of all – so are these mini bundt cakes – such a fun idea Allie! Pinned! Allie! How perfect are these photos?! 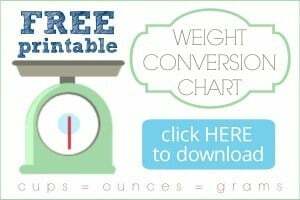 I want to pin every one of them! Thanks, Beth! I got the idea for filling them from my friend Alice. She’s such a genius! Ha ha cute! You’re too sweet. Thank you Nora! Your boys are so lucky to have a mom with so much creativity like you … these are so fun for birthdays! We have birthday season at my house, too. It’s Summer time. These would be fun to make while we enjoy the bdays outside. You’ve inspired me to use my mini bundt pans! Yay! I love the mini-bundt. I’ve actually got more than one mini-bundt pan, each one is special in its own way, lol! Thank you so much, Gloria, for the sweet comment. Hope you’re having a terrific week, my dear. 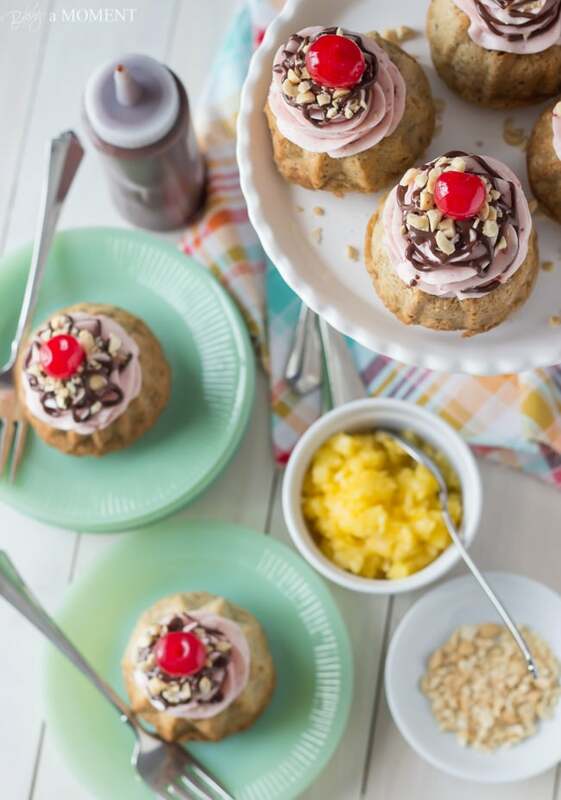 These are absolutely adorable, and so many of my favorite flavors come together in one recipe! — What a great idea to use the ‘well’ in the center of the bundt cake for filling. I will definitely have to remember that for the future! I am literally salivating at the screen! These sound SOOOOOOOOOO good! I gotta get my hands on that bundt pan! Thanks, Meriem! You’re too sweet. I love using the mini bundt- such a pretty result, with minimal effort! Ummmm, these are literally the most adorable little cakes I HAVE EVER SEEN! I need this bundt pan ASAP! I also love the whole banana split theme going on here. Looks delicious, Allie! Oh my gosh, Allie these cakes are just gorgeous! 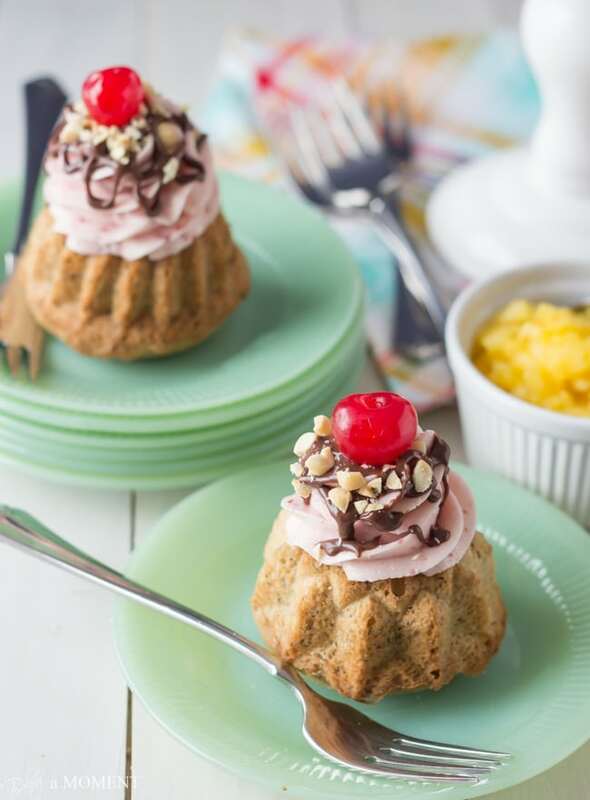 Just love the idea of a banana split in the form of cake and in mini form, no less! So perfect for spring, but I would happily eat these adorable cakes every day. 😉 Your photos are just mind-blowing amazing! pinned. Hey Grace! Great question. Both recipes are really good, but I actually prefer the ones with the freeze-dried strawberries. I just thought the flavor was more pronounced. If you can get your hands on them, I definitely recommend! Enjoy! I really loved that chocolate mini bundt post from Alice, too. I LOVE your spin on the whole decorated mini bundts theme, Allie. These are adorable! My bday’s in July…I’m gonna start printing this and leaving it around in the hopes that someone will make them for me! Allie, These look amazing!! Thanks for linking up to Best of the Weekend. This post will be FEATURED this week. Come party with us again starting at 7pm Central time tonight. OMG! OMG! My son’s birthday is at the end of this month. I asked what kind of cake and he said a banana split cake…(truly he wanted me to make a cake in the shape of a banana split) but anywho..we were talking and he said he would love a banana split cake. I’ve been racking my brain trying to come up with something. Just by chance I stumbled onto this recipe!! I was settling on just a banana cake for him with strawberry frosting….nope, gonna do this instead, but want to make it into a regular size bundt cake instead of 6 small ones. Would the recipe be enough to make 1 regular size vs. the 6 small ones? Or should I double the recipe? Ha! I love it; it must have been fate, lol! You know, bundt pans come in so many different sizes, it’s hard to say but I can tell you that this recipe makes around 3 cups of batter. So I’m thinking probably double it and maybe even triple it! Good luck and happy birthday to your son!